Replacing a major home appliance is never fun or convenient, but the experience can go just a little smoother if you can start preparing for such a major purchase before things head totally south. 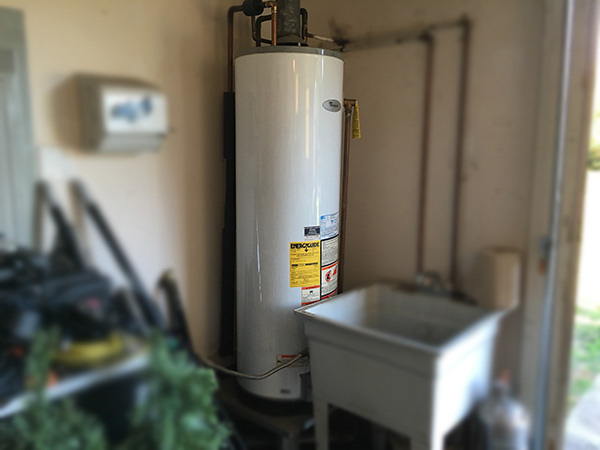 If your water heater is more than 10 years old, it's time to start looking for a new water heater. If you aren't sure how old your unit is, you can discover it's birthday by checking out the first 3 characters of your serial number. So, let's say your serial number is "J114881793." The first character (J) will tell you the month your hot water heater was manufactured; since J is the 10th letter in the alphabet it corresponds with the 10th month of the year, which is October. The following 2 characters (11) indicate the year 2011... so "J11" means your water heater was "born" October 2011. Anything older than 06 may be heading for a leak or failure. If you turn on the hot water in your home and it comes out rusty and metallic, that's a telltale sign your water heater is basically rotting away from the inside out. But, before you jump the gun and buy a new unit, there's an easy way to make sure the rust is actually coming from your water heater and not just your pipes. To check, VERY carefully drain 3 5-gallon buckets worth of water from your water heater (again, be VERY careful because the water will be extremely hot); if by the third bucket the water is still coming out rusty, the problem is not your pipes. We've explained to you before that you need to regularly flush out your water heater, because if you don't sediment will build up on the bottom of the tank until it hardens. This solid mass of buildup will not only create banging and rumbling sounds — which are essentially your water heater's cries for help — but it will also keep your unit from running efficiently and potentially cause leaks. If you pass by your water heater and notice a puddle under it, it may be time to say goodbye. If you can rule out the leak coming from a fitting, pipe, or connection, there's a fracture in your tank that is a clear sign that it's time for a replacement. If you're experiencing any of these ominous signs (or maybe some others) and are in the process of choosing a new water heater, be sure to take into consideration the size of your house (or business), the number of people living in your home, how much hot water you use on a daily basis, and even maintenance. If you need help making the right choice or identifying a problem, give us a call at (864) 242-5511 or contact us online — we're here to help with all of your plumbing needs! If you enjoyed this plumbing article, please check out other posts on our blog and join us on Facebook, Twitter, LinkedIn, and Google+ to see why the Greenville, SC area calls us "The Picky People's Plumber!"